At the gym last summer, a hot day in July, my little daughter romped around with the three year olds. Her teacher made sure to remind the children that it was great to jump and run around in the gym where it’s safe rather than launching themselves off furniture at home. This advice was directed at my little girl specifically. We signed her up because she tried to use the back edge of the couch as a balance beam. The twinge in my own hips makes me question whether the gym is better, but at this time in our lives, having my child jump on a tumble track rather than our couch seems like a good alternative. Last summer, I basked in the comfort that my child was three and simply getting her energy out before she broke a bone scaling countertops at home. But there are some things I can’t stop. Or won’t stop. Or don’t know how to stop. Or won’t stop because deep inside where my ankles crack on stairs or muscles pop a little after sitting, I know how my little daughter feels. Yesterday was one of those days. My daughter is still three. She’s still little. 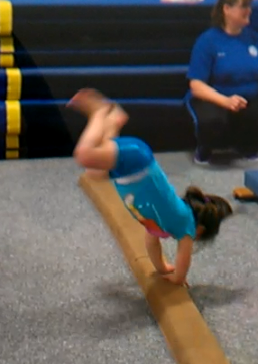 And she was supposed to be hopping on a practice beam, a beam that literally sits on the floor and is only about two inches tall. But, instead of hopping, she tried to cartwheel. Now, you have to know my daughter can’t cartwheel, but that doesn’t stop her from trying every single night in the kitchen. Hundreds of cartwheels. Each one looks more like an awkward side aerial with hands down than a cartwheel. And sometimes, she gets in a hurry, and I remind her: hand, hand, foot, foot. And then, last night at the gym, where she was supposed to hop across the beam, she cartwheeled instead. Without asking permission or even giving a warning. She made up her mind that this was her moment to show the teacher her cartwheel. She stood straight, her hands in the air and cartwheeled right off the beam, of course. It wasn’t straight. It wasn’t nearly perfect. But both little legs circled almost vertically over her head. It was a cartwheel. It was real. And she knew it. She felt it. And then she hopped across the beam because that’s fun, too. This moment is significant because on most nights, while she plays with the parachute and jumps over a little rope to develop coordination, our trips to the gym are one thing. When she learned how to do a forward roll, I told myself that every little girl should be able to do a forward roll. When she stood watching a telecast of a gymnastics championship muttering, “I don’t know why Miss Robin doesn’t teach me how to do that,” I thought it was cute. But now, she has a skill. When I asked what she was taking to daycare for share day, she said, “I’ve got my cartwheel in my pocket.” And intellectually, I believe I have to make a decision. I have to decide whether I let her continue on this path toward new skills. Do I really want her to get the bug for a physical activity that will wreck her little body? Gymnastics isn’t a life-long sport like tennis or golf, but a sport that takes enormous control and grit and determination. I could stop. Right now. I could just stop driving her to the gym every week and sign her up for violin. Or Japanese lessons. Or nothing at all. We could play in the park, but she always gravitates to the monkey bars where she swings all the way across, hoisting her little body from rung to rung and back while I chew on my nail and stand, “all the way over there,” like she tells me to, inching closer when she’s not paying attention. Or, she could just use the mini trampoline* in the living room (another measure to stop illegal scaling of the antique buffet). Except that the trampoline has a bar for balance, and I caught her flipping over it. And that's sort of the point. Even if I didn't take her to a gym where the bar is stable, she'll find an unstable one to flip over. Entrepreneurship is a lot like needing the next skill. Entrepreneurs want to achieve one more thing. To take one more step. To clear one more hurdle. And when the moves are right, they are easy to feel. Telling my little daughter to stop trying to cartwheel is a lot like telling an entrepreneur to just get a job. As a nation, we encourage entrepreneurial activity by calling the U.S. the “land of opportunity,” and by opening technology incubators and small business assistance programs. We have volunteer organizations, like SCORE, that pool their resources to help entrepreneurs achieve the next step. And no one is asking, Are we really just fueling an adrenaline addiction? I so badly want to say no, that supporting entrepreneurship is driving the economy. Entrepreneurs are a lot like my daughter. Entrepreneurs do moves like cartwheeling on the beam without permission in order to get to the next level, the next benchmark. Thankfully, they do. What would have happened if the pirates of Silicone Valley had stayed in college, done their homework, gotten jobs after graduation? When my little daughter landed that first real cartwheel, she didn’t turn to her coach to ask, Was that a real one? Instead, her eyes lit up and her mouth fell open because she knew, she felt it. And it was that, more than the cartwheel that scared the bejeezes out of me. Because that thing? That feeling of knowing? No one teaches it. But entrepreneurs know this feeling, too. Sometimes, good decision making gets exchanged in an effort to get that feeling back. In the scope of things, I’m just a pawn—a driver so she can get to the gym—a person who can workshop a brochure that might sell another product. But it doesn’t matter if I think learning to cartwheel is a bad idea or whether the product I’m helping to market is a widget no one will buy. I can’t stop an athlete or an entrepreneur from attacking the next rung. I have moved from being the one who feels the perfect cartwheel to the one who helps others feel that thing that sells an idea. When I coach entrepreneurs working on pitching ideas, I listen to the words of the pitch, which vary in every new delivery, but I also listen for this other thing, an instinct, for the sound of the entrepreneur who knows that the idea and the pitch are spot on. When I hear the equivalent of a cartwheel’s crooked leg in a pitch, I know that’s the place that needs work—not necessarily in the words, but back in the shop. Maybe there’s a blip in production, in financing, in the details. What I do is very different from teaching someone to write fiction or to write poetry. Fiction or poetry has an end in itself: the poem or the book. Once written, there’s a satisfaction in having written something that sings inside your heart, has meaning that only you truly know. But for entrepreneurs, words work as a scaffold to the next level, the next step, the next phase. A pitch, a proposal, a presentation all need the right approach. It’s realizing when the adrenaline of getting to the next level is masking good decision making. It’s knowing vs. needing. And, just like my daughter knows when her cartwheel is real, entrepreneurs know when a pitch or an idea is spot on. And if the words are mired in the details of a complex idea, or scrambling within a bad idea, someone needs to help entrepreneurs step back and sort that out. It's being able to separate knowing from still needing to do something else. It's knowing that sometimes you have to wait and sometimes the right approach is standing in front of a beam and knowing it’s time to cartwheel instead of hop. *This trampoline has been recalled and we have stopped using it. People have reported that the metal bar breaks off. The bar is supposed to be used for balance, probably not for flipping.